While I was at Burn2, I had a talk with one of the communications staff, iSkye Silverweb. She was happy to speak about the festival, and we soon met. "Hello, welcome home, Bixyl!" she greeted me with the expression of welcome the Burners often gave. "Thank you," I answered with a smile, then began the questions, "So about how long have the preparations for this year's Burn2 been going? Skye answered, "Oh we started ... hmm, the planning table meet every week all year. We had our last event, Burnal Equinox, and after the wrap of that event we actually started thinking about BURN2's October event. That would be back in... July/August." I nodded, "How did you come up with the name and theme?" 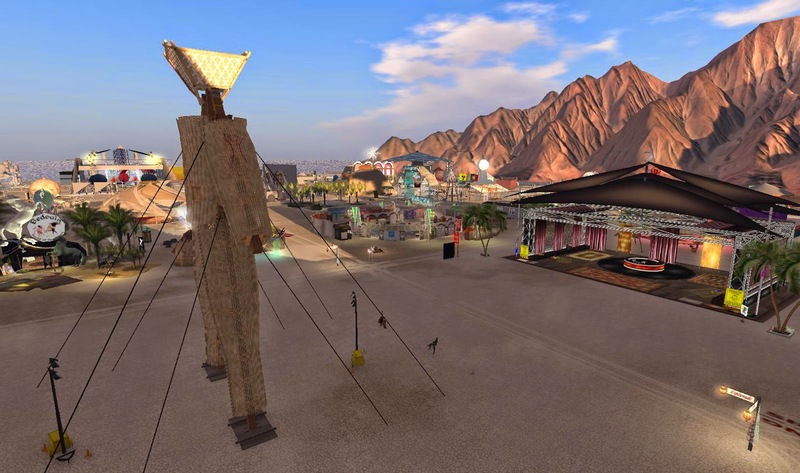 "We followed the RL Burning Man's theme this year," Skye answered, " which was the same, Caravansary - we saw so many possibilities that could happen in a virtual setting and let me tell you the builders did NOT disappoint!" "Sounds like visitors can expect some great exhibitions," I commented. Skye continued, "Caravansary is based on the old Silk Road of yore, the crossroads of trade and civilisations. ... Oh yes! We have had some great musical and dance performances. Yman made a return this year with an eye-popping performance of light and particles. That was with the Changhigh Trinity Sisters"
"Interesting. Where is this exhibition?" I asked. "This was performed yesterday and Yman's troupe will perform again later in the week," Skye told me, "I can show you the stage if you like." "Do you have a day and time (for the performance)?" I asked, "And certainly." "Let me check the calendar for that information, I knew you would ask!" 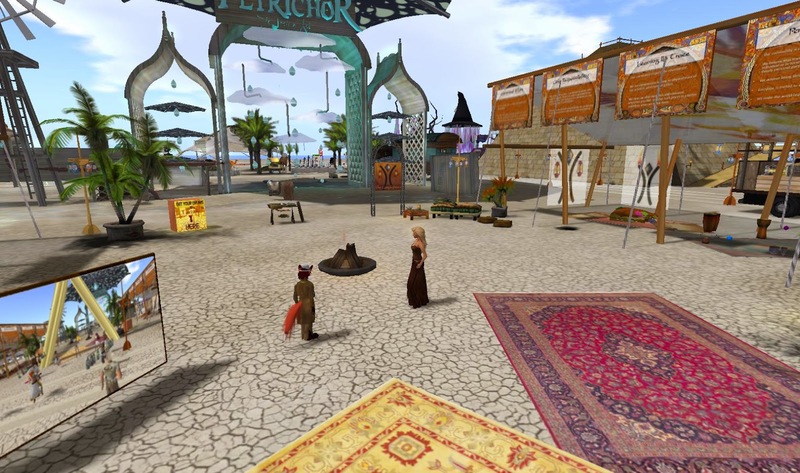 After a moment, she answered, "The Changhigh Trinity Sisters will perform at 2;00pm SLT Sunday the 26th. You can see the complete schedule of events here: http://www.burn2.org/calendar." Skye went on, "One of our traditions is the Lamplighters' processions, which are held at 11am and 7pm SLT each day, except for the last Saturday and Sunday.Those days are Burn days - we show up and drum a bit, then after the Burns we lead the people into the embers to dance." "About how many are involved in it?" I asked. "How many participants or Lamplighters?" Skye replied. "I meant how many Lamplighters are involved?" I corrected. Skye answered, "The size of the group varies depending on availability. For planning the processions, we have a Council of Elders, comprised of 4 Elders, and we do the planning for the Lamplighters events including processions. We added the 11AM time this year bcause we wanted to include our European contingent. And as it turns out we have a pretty good turnout at that time, which is pleasing. "Sounds good," I then asked, "have there been more participants and Burners from that time zone lately?" "This weekend, yes!" she answered, "and I am hoping that hold true during the week, since that is early to mid- evening for Europe. An easier time of day than our 7pm SLT time which is the wee hours of hte night. I have already received appreciative feedback about that 11am time and that's been exciting for us. I think that's true too of BURN2 in general. We like having more people come so we make performances and exhibits available more hours of the day. We've had a very good time and a lot of fun. (The) people here really do live those 10 Principles of Burning Man we talk about." "Sounds good. Could you remind the readers of those?" I asked. "Oh definitely!" Skye told me, "You can find them here: http://thelamplightersblog.wordpress.com/ten-principles/. And I have a display of those ten principles of Burning Man over in the Lamplighter Village, would you like to see them? The Village isn't far - we can walk." "Sure, and no problem," I told her. We then walked to a place with a tall Burning Man symbol in the front. On the sides were two tents making up the length of the place with the side toward the inside open. There were signs hanging halfway down from the top, five on each side for a total of ten. "This is the Lamplighters' Village," Skye told me, "And the Ten Principles are on the ten posters you see on either side of this courtyard. This is where the processions start and often end too. The processions go to the Temple which is two sims away. And it is always an experience to cross sims on the way but that in no way diminishes the enthusiasm of people who come along." I nodded, "How long did 'The Man' and the Temple take to build?" "Both took months to build," she answered." "Whom was involved in their design?" I requested. "The Lamplighters oversee the Temple build," Skye told me, "and I was the contact for the Lamplighers with the Temple builder, who is Midori Rotaru. We liked her Temple so much last year, that we asked her to come back and build it again this year. She has an assistant, Chyenne Devin, who works with her. For the Man, Marianne McCann is the build team lead, and Pygar Bu works with her. There is at least one other person but I would encourage you to talk with Marianne and learn more about how that build happened." "Between this and Bay City, they must be busy," I commented. "Definitely!," Skye responded enthusiastically, "I think that's true for many of us here at BURN2. This is entirely a volunteer planned and driven event, nearly entirely resident funded, and all of us are also involved in other projects around SL and in real-life. We do this because we love it, we believe in and practice the Ten Principles as much as we can." "About how many here have been involved with both the Burning Man festival and Burn2?" I asked. Skye answered, "I can't tell you a number but I can tell you this, an increasing number of people here will tell you they also were actively involved in Burning Man, every year. It's been exciting to see the number of people coming in and saying 'I'm from the real-life Burning Man,' or 'I went there and this FEELS just like home.' That's gratifying. To get numbers of who is involved in both, I think the best person to ask about that would be EmCee Widget or Ronon Carver. EmCee is the Regional Representative for BURN2 to Burning Man." "If you would like," she suggested, "I can teleport you to the Temple and to the Man so you can get snapshots of each." I agreed, and she then told me, "Okay let's go to the Temple first, then The Man. I think it's a fitting conclusion to end at The Man because 'he' is why we do this. I will go to the Temple and teleport you there. One moment." She then ported away, and a few moments later I was sent a teleport request. I took it, and in an instant I was before the front of a black structure with a red cloth over the front opening with four tall tourches around me and pictures of previous temples to the sides. "Let me know when everything is rezzed for you," Skye told me, "On the other side of the road behind you is a sim border, just a for-your-information." After some more moments, I told her most everything was clear and in color. "We can go inside," she then led me inside, showing me around. Inside was four large bases with white light beaming up from each, and in the middle of them a large reddish globe that was hollowed out with an opening on top, from which it glowed white, on a steel base that somewhat resembled a large steel flower, "That is the censer." Looking back outside, I commented, "I notice there are pictures of earlier temples." 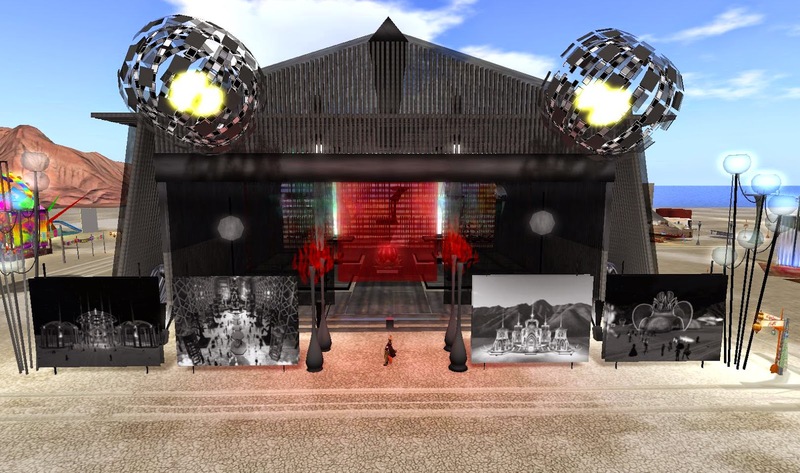 "Yes, Midori did a wonderful thing," Skye told me, "She wanted to show history of the Temple at BURN2. So she asked for some snapshots of past Temples, I thought it was a wonderful gesture." She drew my attention to the structure's appearance, "You might notice there is a lot of black in the colour here. This is a cultural thing. Asians see black as a happy colour, a colour of warmth. In Western cultures we don't see it that way. And so Midori being Japanese, she incorporated that because it fit so well with the Silk Road concept. A lot of Eastern peoples crossed those trades routes with the West. So again, being in touch with history, We thought it was a marvelous idea." "About how many people here have left messages so far?" I asked. "Let me check," Skye paused for a moment, then answered, "twenty so far, and the festival opened yesterday. we anticipate that number to go up very quickly over the week. At the Temple Burn next Sunday, the messages in the censer will be read aloud, shouted, so everyone within 100 meters will be able to see them in text. This is something that really is very deeply moving for a lot of people. And then once those messages are read off, the burn commences. Really special experience." 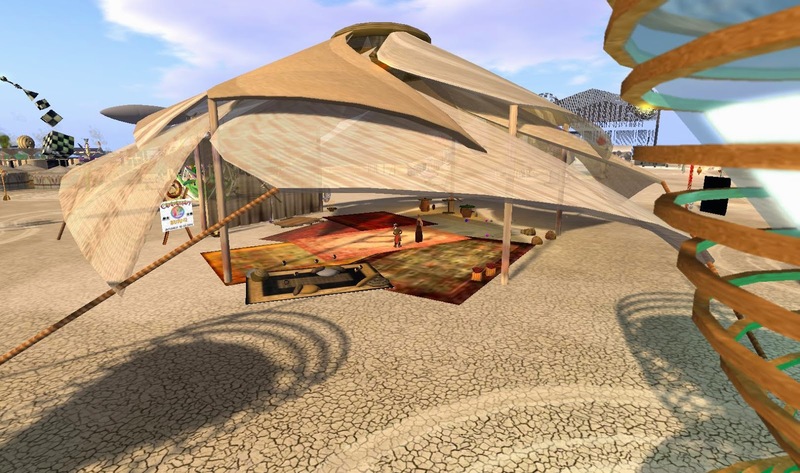 I brought up, "I recall when SL was being developed, some of the Lindens visited the Burning Man festival, and it had quite an impact on them." Skye brightened, "Yes! 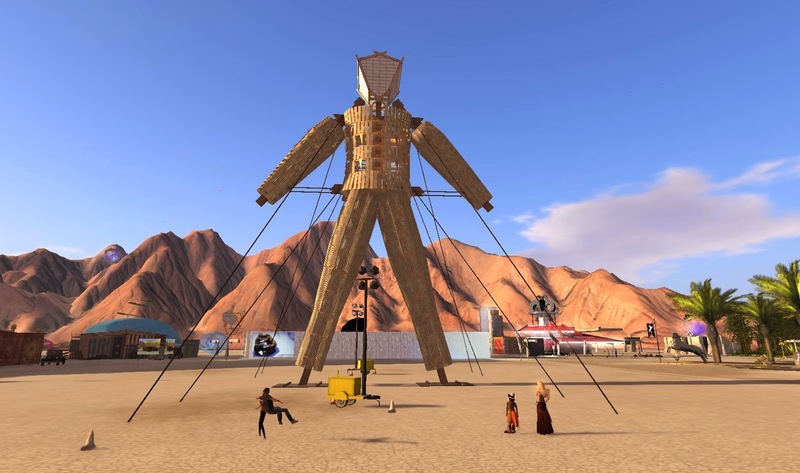 so for the first six years of the festival in SL, the Lab actually supported the festival and it was called Burning Life at the time. Then in about 2010, the Lab had to withdraw its support. But then the resident Burners wanted to keep it going, and so it morphed into BURN2. Became a virtual regional of Burning Man in order to continue here." I commented, "I've heard that lately the company policy of discouraging fraternization has been reversed. Have you seen more interest by the Lindens of the Burn?" Skye answered that they had, "We actually saw Torley here yesterday during the Lamplighters procession. We were delighted to see that. And I believe other Lindens may have visited while I was not here. I don't know if other Lindens plan to come and visit but we would love to see them here. For all we know, they have been. I'm not here on the playa 24 hours a day so I couldn't tell you but we would welcome them as fellow Burners," she smiled. Skye continued, "Any other questions here, before we go to the Man? ... There are stages between here and there, with various musical happenings as per the schedule. Feel free to drop by those stages, such as the Temple stage, the Man Stage, and Center Camp. 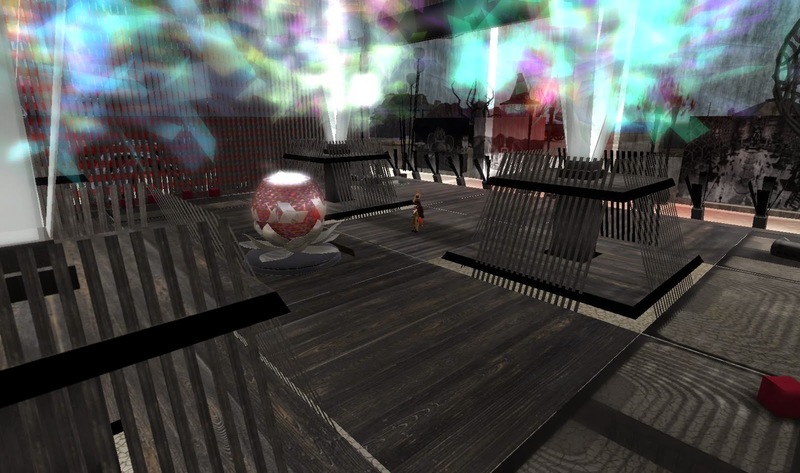 Then Yman's exhibit, Idle Rogue, Organica, all are also musical camp stages among others. Let's go to Center Camp so you can see what that is, that's the social hub of the Playa especially when there is a performance going on that's on the way. You can see it from here if you draw distance is up around 200 meters or more. When you cam from above, it looks almost like a whirling dervish's skirt, thus its nickname 'the dervish tent.' "
"Let's go to Center Camp, best to teleport or we will cross a couple of sim borders." She smiled, ported away, then sent a TP to me as well. After heading over, "This is Center Camp and it's quiet at the moment, here. I do see a good number of avatars around on my radar, but here, yes, at the moment. I call it quiet because it LOOKS quiet - but I'm deaf so I wouldn't hear if there is any music going on nearby *grin*"
I looked over on my own radar, "I see some to the north, at a red tent." "Probably a performance there. We could stop over there when we finish our little tour, if you like Bixyl," she suggested. "It's up to you. I was able to cam over to take a picture," I answered. "Good, ok, then a hop to the Souk and then the Man," Skye told me, "I will meet you there ..."
We both teleported to the location in question. The place looked like a bazzar with booths and tables full of goods, "So what's the purpose of this building?" I asked. 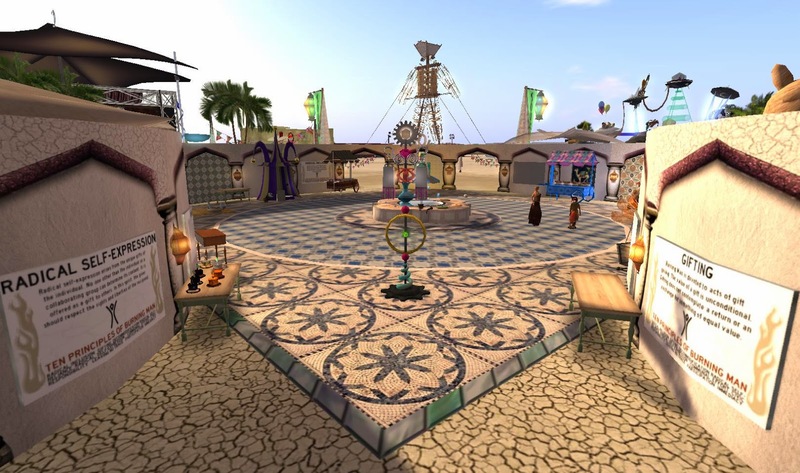 Skye answered, "This is to emulate the souk, a marketplace along the Silk Road. It is the center of trade, but of course here no money changes hands. Things are admired and graciously given. And people meet, perform, play music, or do whatever they wish. One person offered 'free hugs.' "
I chuckled, "Heh, what was the reaction?" "All sorts of them," SKye answered, "amusement, a little chagrin, shyness but once hugged invariably the huggees felt much better! I think this will be more used during the week. This weekend has been mainly focused on opening acts and getting things underway. The marketplace should come to life starting tomorrow (Sunday), espcially later in the day." "Then on to the Man," Skye prepared to port over, "see you there in a moment." "I think it's just over there," I commented, and began walking the distance over instead, about a quarter length of a sim. Getting there, Skye smiled, "Crossed a sim border without incident! Now, about the Man..." She pointed up at the huge wooden human-shaped structure, "In real-life, it was 100 feet tall. That works out to about 32 meters. This Man here, is the equivalent, 32 meters tall. And you'll notice he is standing directly on the Playa. This is a first. Uually he stands on a base. Its' not THE first (time) but it's a first in a long time." "Why none this time?" I asked. "They wanted a challenge, I guess!" Skye suggested, "It burned very well, but took a LONG time to burn, in real life. However, Marianne, The Man team lead says it will NOT take two hours. The real-life Man took well over two hours. I encourage you to talk more with Marianne McCann about the work on the Man." I had the radio in, which wasn't broadcasting music but people speaking about something, "Oh, I noticed the radio chatter. What might this be?" "I'm the wrong person to ask," Skye told me, "I don't hear it! sorry." Then the chatter ended and some tunes started, "Oh, well, it ended and replaced with music." "Probably a stream then," she looked around, "there is a stage right behind us, The Man Stage, across the road there." She changed the subject back to the tunes, "This year they tried not to allow people to have too many music events on at once," she gave two reasons, "a) lag, b) people want to see them, and if they are on at the same time there is that competition for people's ears. So this way people can enjoy everything if they wish." "Has that meant fewer musicians this year?" I asked. "Actually," she answered, "We've been happily enjoying about the same number of performers this year. The performance lead for BURN2 this year is Larree Quixote. He manages all the official stages and the performers on the playa." "Ohh, we've had DJs like Puterdoc Devinat Camp Idle Rogue," Skye answered, "and live performers like ... Guerrilla Burlesque (which) performed here last night. We have trance at one of the camps, psytrance, good old rock'n'roll, jazz, blues, all types live and DJ'd." "Oh, and DRUM performed here today! One live performer, Bamboof Stillmorning, very popular here. There are others, but as I'm deaf, I'm not the music expert here. .. But I refer you to Larree Quixote, who can tell you a lot more." "There are some lovely art builds, I hope you explore them. They are like little gems scattered all over the Playa, and every one of them is worth seeing. There's a little petite camp 'refuge for little Burners,' just one example." "So what are your plans after the Burn?" I asked Skye. 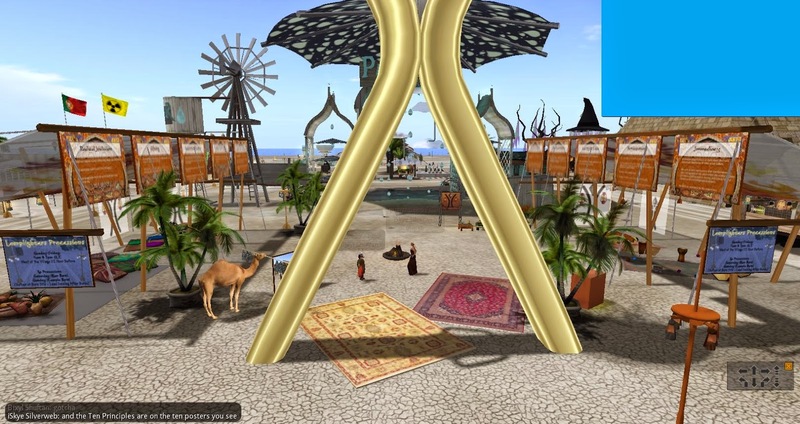 "After the Burn, I myself will be looking ahead to Virtual Worlds Best Practices in Education, VWBPE, and also I'm active in Virtual Ability so I will be helping Gentle Heron plan the Mental Health Symposium. Both of these touch very important values for me, education and the disability community. VWBPE will be March 18-21, 2015; the Mental Health Symposium hasn't be set with a date yet." "Was there anything else that you wanted to mention?" I asked. "No tha'ts it," she answered, "but I hope you will explore some of these art builds. Such clever and inventive creations here." It was about then that Skye and I parted ways, leaving me to see the rest of the Burn2 grounds. Burn2 would continue for another week, culminating in the Burning of the Man, and then the Temple Burn. For those who missed the festival, the Burners hold a few smaller events across the year. And of course Burn2 will be back next year.